In a large bowl, combine 6 cups of water and the lemon juice. Peel the pears and cut them in half lengthwise. Remove the core and stems. Add pears to the lemon water as they are peeled and cut and set aside for use later. In a large pot, combine the rosemary, vanilla bean, sugar, wine, vinegar and the remaining 1 cup of water. Bring to a boil over medium heat, stirring often until the sugar is dissolved. Reduce the heat to low, cover and let simmer for 5 minutes or until liquid is flavourful. Increase heat and return to a boil. 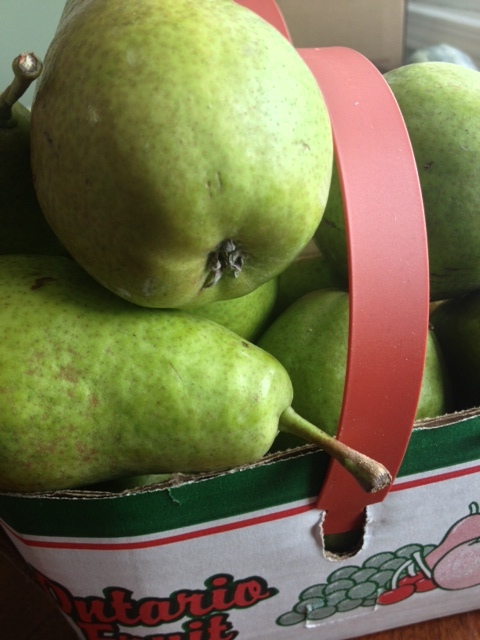 Drain pears, discarding soaking water and add to pot. Simmer, gently turning pears occasionally, for 5 to 15 minutes or until pears are tender when pierced with the tip of a knife, adjusting heat as necessary to keep the liquid at a simmer. Using a slotted spoon, transfer pears to a bowl, covering them to keep hot. Increase heat to high and boil liquid for about 10 minutes or until reduced by about 1/3 and syrupy. Skim off any foam. Reduce heat to low and keep liquid hot. Discard rosemary and vanilla bean. Using a slotted spoon, pack pears into hot jars, rounded side down, leaving 1 inch headspace. Pour in hot pickling liquid, leaving 1/2 inch headspace. Remove air bubbles and adjust headspace as necessary by adding hot pickling liquid. Wipe rim and place hot lid disc on jar. Screw band down until fingertip tight. Place jars in canner and return to boil. Process for 20 minutes. Turn off heat, remove canner lid and let jars stand in water for 5 minutes. Transfer jars to a towel-lined surface and let stand for 24 hours. Check lids and refrigerate any jars that are not sealed. These pears and syrup are best served over some vanilla ice cream or frozen yogourt. Enjoy!